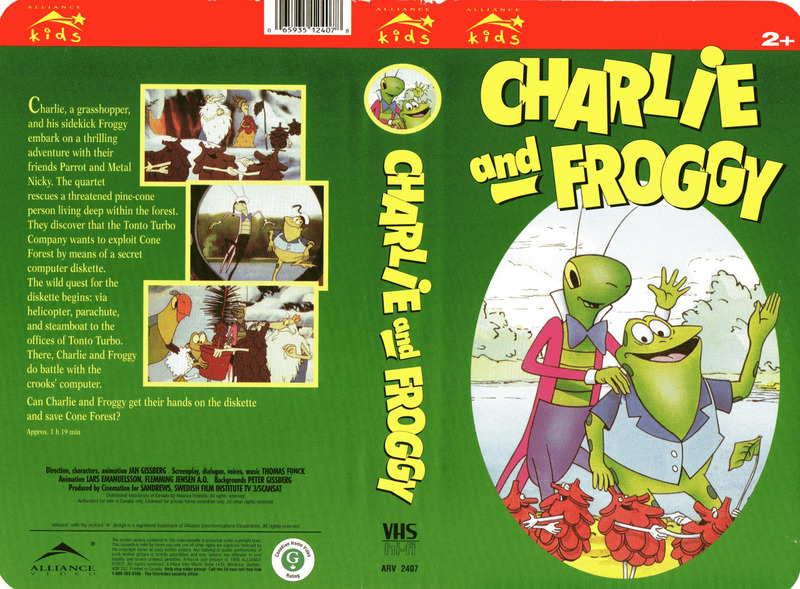 Charlie and Froggy VHS cover. Charlie Strapp and Froggy Ball Flying High is an English dub of the 1991 Swedish animated film Kalle Stropp och Grodan Boll på svindlande äventyr which is based on the Kalle Stropp och Grodan Boll radio series created by Thomas Funck. The dub was only released on VHS in Canada by Alliance Films under the name Charlie and Froggy. However, the actual film is still called Charlie Strapp and Froggy Ball Flying High. Copies of the VHS tape are extremely rare, and the English dub couldn't be found on websites such as YouTube. The English dub was produced by Filmor, and the voice acting was recorded in Montreal, Quebec by Cinelume. Most of the characters' names were changed and four minutes of footage was removed. Additional dialogue was also added to some scenes. This was not the first time that a Kalle Stropp och Grodan Boll film was released in Canada. The 1987 short film Kalle Stropp och Grodan Boll räddar hönan was dubbed in Canadian French as Criquet et Grenouillot which aired on Radio-Québec (now Télé-Québec) in 1989. Unlike the English dub of Charlie Strapp and Froggy Ball Flying High; This dub has no home video release. In August of 2016, a YouTube user named "Lost Animations" uploaded the full film in Canadian English. Sometime between August 2016 and October 2017, the video was taken down. On July 25th, 2017, YouTube user Jack Foster uploaded the English dub. However, that was soon taken down too. On January 22nd, 2018, YouTube user "deck bach" uploaded the full dub. This was the third time it had been uploaded to YouTube. As of the updating of this article (March 2019), the dub has survived on YouTube for a bit over a year, however, it is unknown if the dub will get taken down again. The Canadian English dub of the animated film. What is strange about it is that the back of VHS cover uses the original Swedish names for The Parrot and Green Cone and has a translated version of Sheet-Niklas' name.